A recent web-site query reminded us that there are people to whom Things That Everybody Knows™ are new and not known. "The catalogue says these stamps have 'varnish bars' – what is that?" 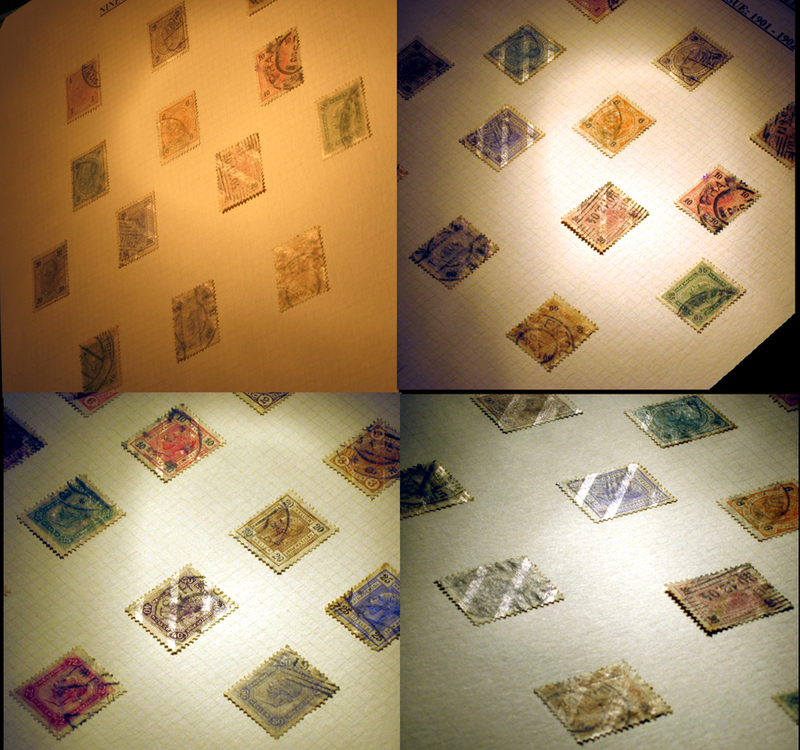 Experiments were begun using sheets of 1890, 1891, and 1899 issues. The State Printing Works applied to the sheets stripes (aka bars) of varnish (aka enamel) running from top left to bottom right at an angle of 45 degrees; the stripes were 3½mm wide with 3½mm spaces between, giving part of 4 or 5 stripes per stamp, the stripes being printed over the existing design. The Postal Administration then took some old cancellers from their stores and experimented; they found that the cancelling ink did not 'take' on the varnish, but also failed to make much impression on the unvarnished paper. Eventually they found that if they used narrow bars and wide inter-stripe spaces, the cancellations became readable. The first printing of striped stamps for issue was on 3 June 1901, with the stripes printed first and the stamp design added on top; they were sent to the Post Offices in September 1901, going on sale when the previous stamps ran out. The stripes now comprised a shiny part about 2¼ mm wide, and a contiguous dull part about 3mm wide (thus about 5¼mm wide in total), the spacing between stripes being 4¼mm, giving only 3 or 4 stripes per stamp. It was found in use, however, that the width of the stripes was still too great, and the width of the dull part of the stripe was reduced, the shiny part staying at around 2¼mm wide. According to Müller (Die Postmarken von Österreich) "A paper was already used in 1902 in which the duller part of the stripe was only about 2mm, the total width of a stripe was now 4¼mm and the spacing between stripes 5¼mm" and "finally in 1903 the dull part of the stripe fell completely away, leaving only the shiny stripe, 2¼mm wide, the distance between stripes now amounting to 7¼mm." Three values from the 1902 issue. The 3h and 10h show how the cancel ink does not 'take' on the varnish. It is apparent that these statements have been picked up and quoted by the catalogue and handbook editors. Michel even prices three types of varnish stripes (5¼mm, 4¼mm, 2¼mm wide), and gives higher prices to the type II (4¼mm wide) striped stamps. In fact, as anyone who has attempted to separate these "three types" will agree, life is not quite that simple. For a start, the stripes, and especially the dull part, are not always easy to see, and the need to squint along the stamp, held up to the light, is a sure recipe for eyestrain. Attempts to measure stripe widths add frustration to eyestrain! Nonetheless, several points can easily be made. 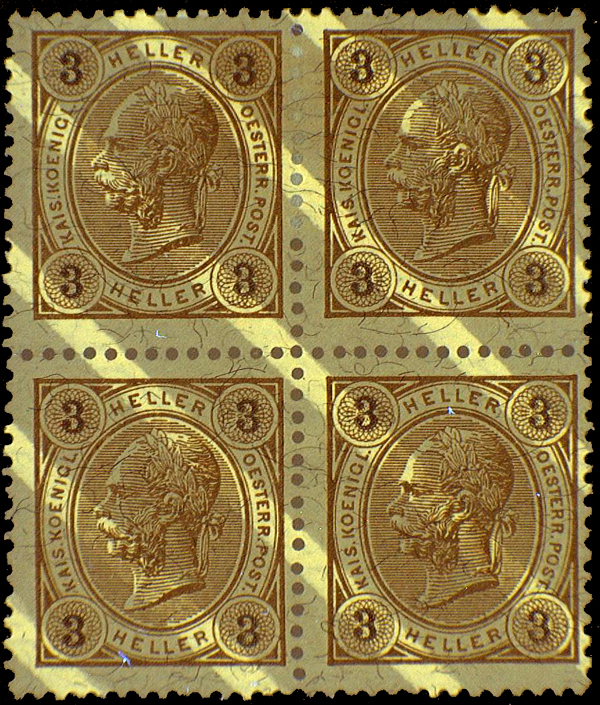 Firstly, when considering the 1901 issue, stamps with dull and shiny stripes a total of 5¼mm wide, or with just shiny stripes 2¼mm wide, are clearly in a minority. Secondly, the majority of stamps have stripes with a dull part between about ½mm and 2mm wide. The exact 4¼mm total width of "Type II" is quite unusual. As Müller points out: "Since the reduction of the stripes took place gradually, it is not possible to draw a sharp boundary between the papers with the different widths of the enamel stripes ...". Thirdly, the dull part is sometimes poorly printed, giving a markedly uneven edge to the stripe. Fourthly, the sheets of paper printed with the varnish stripes were obviously randomly fed into the printing press to receive the design, as the dull part of the stripe may be found either above or below the shiny part. One wonders, in fact, how the dull/shiny stripes were printed. Presuming that the paper was passed through two machines to receive the dull and shiny parts, one would assume that cases of mis-alignment might occur. Shiny bars printed over the dull part would, presumably, not be obvious, but a gap between the two parts might exist? By the law of unintended consequences, the varnish stripes tended to fall over the numbers of value in the corners of the stamps, making these difficult to see. The 1904 issue was also printed on striped paper; however the experiment was abandoned in late 1905. It’s unclear if this was because the stripes didn’t have the desired result, or they discovered that reuse of stamps wasn’t actually a problem worth worrying about! Perhaps the most interesting aspect of this fortunately short-lived experiment, however, is the special stamps for the Levant post offices. According to Müller and the other authorities, the Levantine issues paralleled the Austrian ones, i.e. the stamps issued in 1901 (Turkish currency at bottom, Heller values at top) initially had dull and shiny stripes totalling 5¼mm, and the dull stripes were reduced until finally only the 2¼mm shiny bar remained. The 1903 issue (Turkish values top and bottom) and 1903 and 1905 issues (Centimes) supposedly only exist with the shiny 2¼mm stripes. In fact, the 1901 issue seem mostly (all?) to be "Type II": that is, they have a more or less narrow dull band. But what is one to make of the 1903 issues (Turkish and French currencies) that still clearly have dull as well as shiny stripes? And what, indeed, of one 1 piastre stamp which has dull stripes wide enough (although irregularly printed) to qualify as a "Type I"? It seems clear that stocks of 'old' paper with the dull stripes were used up when the 1903 issues were printed. It is remarkably difficult to make a decent image of a stamp with varnish bars! A straightforward scan, especially of a mint stamp, fails to show the bars. The bars show up well when looked at sideways, as is shown in the left-hand illustration below – however all detail of the stamps is lost. Using Photoshop to distort the image (right hand illustration) is no better. One can fake the bars with Photoshop (bottom left) but it looks faked! Several attempts using natural sunlight at an angle produced nothing useful.